When you think of Provence, France, you might think of lavender fields, olive groves, rocky outcrops topped with walled villages. You’re thinking of an area called the Luberon, at the foot of the Luberon mountain range. This area was put on the tourist map by Peter Mayle with his book, A Year in Provence. People discovered the villages of the Luberon area and were enchanted. Pure Provence! 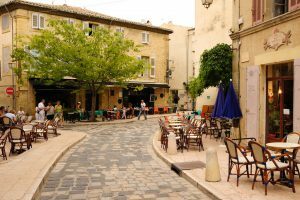 Here is a circuit of 8 towns you can visit by car, starting and ending with Avignon, with deep Provence in between. 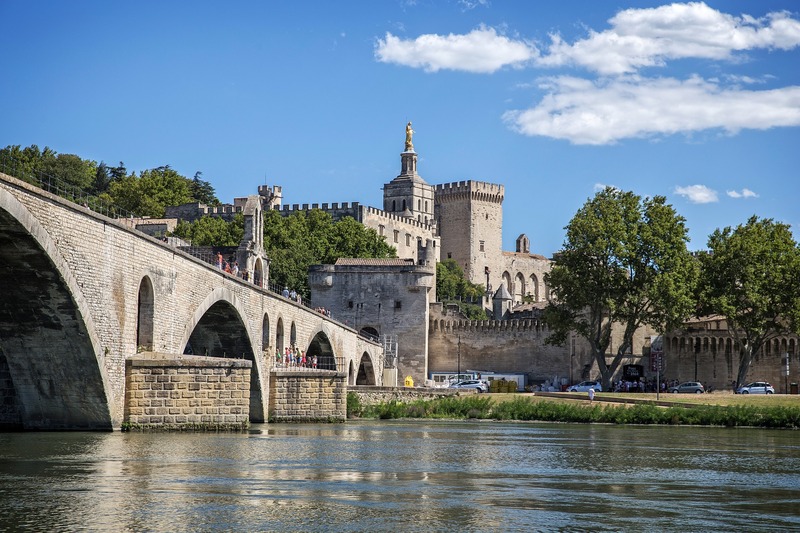 From Paris or wherever you are landing, take the TGV fast train to Avignon. Plan to spend a day or two there, or a day before and a day at the end of your circuit. The following itinerary requires a rental car, which you can get in Avignon at the train station or in town. The villages are so close to one another, you’ll spend more time visiting than driving. You’ll travel southeast and make a circle counter-clockwise until you end up, a week or two later, back in Avignon. Avignon. this is the largest city in the region and not to miss as you begin your itinerary. Historically, it is best known as the place that the papacy set up shop in the 14th century, so there were two (or three, but that’s another story)! This Great Schism went on for 70 years. There is the impressive palace, but there’s much more to see: cobbled medieval streets (complete with city wall), dining under umbrellas, a historic bridge, and plenty around the city as well, such as the town of Villeneuve-les-Avignon and le Pont du Garde. In July is the biggest theatre festival in Europe. St. Rémy-de-Provence. Drive southeast about 30 minutes and you’ll enter this charming village where you’ll see copies of Van Gogh paintings dotting the town and a fountain with a bust of Nostradamus, who was born here. Along with that are shops, restaurants, and a Provence flair. Parking can be tricky, but there’s a lot in front of the Tourist Info bureau and along the streets. Ménerbes. Go east about 45 or so minutes and you’ll arrive at the town popularized by A Year in Provence. It’s less crowded now that time has gone by and Mr. Mayle moved to Lourmarin (below). The hillside town still draws you, however, to its beauty and history. Lourmarin. Now drive southeast about 35 minutes and you’ll reach the birthplace of Albert Camus, the famous existentialist author. Eat outside on summer terraces, visit shops and the 16th-century castle, and pop in at the Friday morning farmer’s market (one of the best in the area.) It has its own castle and summer festival. Bonnieux. Drive slightly northwest for 20 or so minutes and you’ll arrive in Bonnieux, well-known as one of France’s prettiest villages. It was also near here that the movie, A Good Year was filmed. Like other villages in the region, it is perched on a hilltop. If you climb up to the 12th-century church, you’ll get the best view. 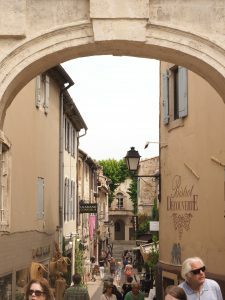 Then make sure you don’t miss the narrow streets, shady squares, art galleries, and Provence architecture on the way down. About 2 miles to the north is one of the best-preserved Roman bridges in France, le Pont Julien. Roussillon. Go north 15 to 20 minutes to arrive at the hilltop village of Roussillon. This village is bathed in a pink, orange, and yellow glow from the ochre which went into the building materials. It’s the most visited village in the Luberon, except Gordes (below.) Explore the narrow streets, browse boutiques, and enjoy Provence on a shady terrace with lunch. You can visit an ochre mine or walk the Ochre Trail for a view of stunning rock formations. Gordes. 15 minutes drive to the west, and you arrive in Gordes. It’s easy to see Roussillon and Gordes on the same day since they are neighbors. Gordes is a village perché, or village perched on a hilltop. As you approach, you’ll notice a more yellow tone to the buildings. The town is popular with tourists and historically, with artists, such as Marc Chagall and Victor Vasarely. There’s an 11th-century château and plenty of Provence to enjoy in boutiques, restaurants, hotels, and art exhibits. Isle-sur-la-Sorgue. 25 minutes to the west is the town that enchanted me when I first saw a video about it. I had to go. 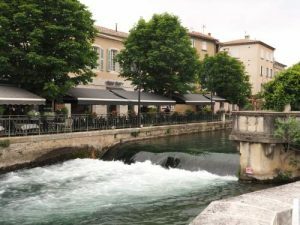 The river Sorgue flows all around the city, and everywhere you can hear water flowing. Cross one of the many bridges to visit the town, stroll the narrow streets, and take in its world-renowned antiques market on Sundays (go early to avoid crowds, or get a hotel there.) Isle-sur-la-Sorgue is unique. 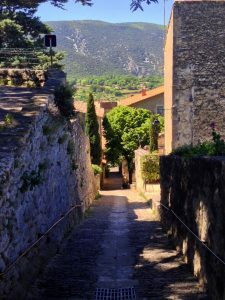 The Luberon is known for hiking, great food, biking, fantastic photos, and amazing open markets (and a fair number of tourists.) If you visit in spring or fall, your crowds will be lower. In May you’re likely to have good weather. It’s popular for a reason, and you won’t want to miss it! 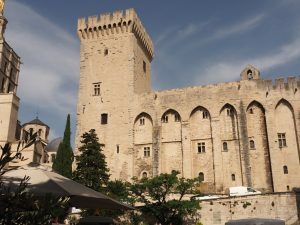 Avignon, Bonnieux, French villages, Gordes, Isle-sur-la-Sorgue, Lourmarin, Luberon, Menerbes, Provence, Provence villages, Roussillon, St. Remy-de-Provence. Bookmark. Wow, this sounds wonderful and the pictures are beautiful. I will seriously consider this itinerary during my voyage to France, hopefully later this year. My preference is a driving tour and this totally takes the guess work out of how to do it. LaCiotat is still high on my list of places to visit. Thanks for this guide. I’m glad you found it helpful! You could even plan to visit the coast, then head up to the Luberon afterward. They’re both in Provence, so it’s possible!